HALLIE EPHRON: This quiet summer Sunday, welcome to my garden. I'm probably sitting out in it right now, sipping my morning coffee and reading the bridge column. My garden is low maintenance, and it surrounds me with bushes and wildlife even as it is in turn surrounded by cars and traffic. An oasis of green. For two years now, we've had bunnies. 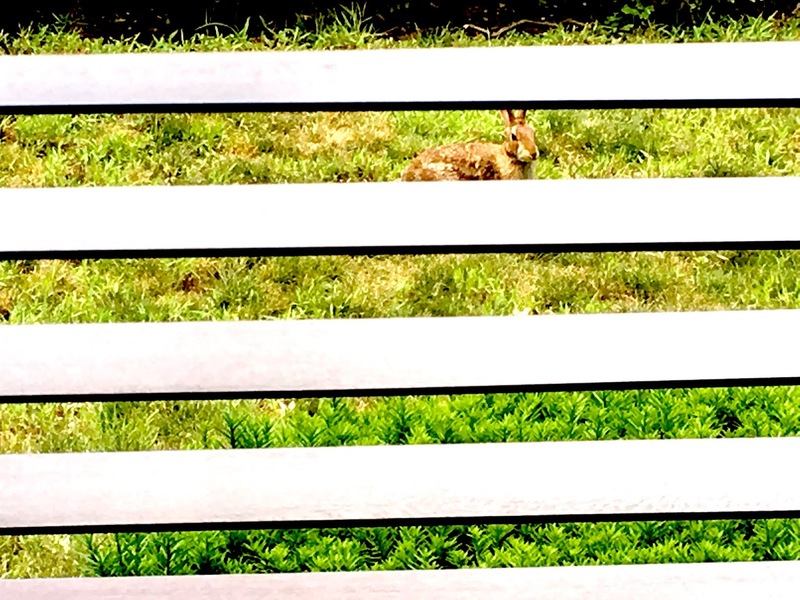 Here's the Momma bunny, chillin' on a hot summer day on the cool grass. She barely notices my presence. And another shot of her taken from inside, through my living room blinds. Then there are the birds. I don't feed them because the squirrels (we have a ton of them) would Hoover it up first, but I keep the bird bath filled and they make ample use of it. 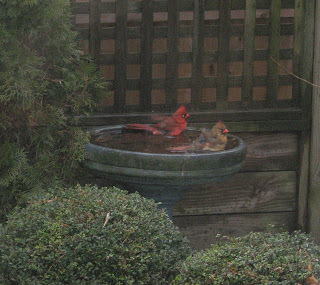 Here's a pair of cardinals. A cat bird. They're my favorites. So cheery and noisy. They're grey with a black cap, and a patch of reddish-brown feathers on the rump, under the tail. And a crowd of sparrows jockeying for position. A winter memory. Bunny tracks in the snow. 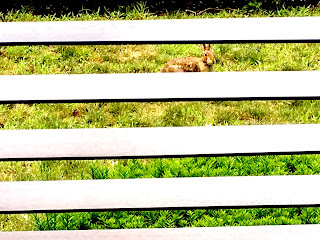 And a finally a visiting bunny rabbit. Summer! It's for birds and bunnies who come to people watch. What's going on in your garden? It's lovely Hallie! this year we've had bumper crops of strawberries and asparagus, now into yellow squash and blueberries. Heaven! I love the visiting bunny! She’s absolutely adorable . . . .
Daffodils, lilacs, and roses are the mainstays of our garden. Sad to say, the last storm did in the weeping willow, but most of the trees around us are pines. Our garden visitors tend to be deer and the occasional turtle who manages to trap itself in the window well. We’ve learned to regularly walk around the house and check all the window wells, just in case a turtle’s waiting for rescue . . . . I love summer, and your garden is a perfect oasis. Mine is giving us blueberries, lettuces, sugar snap peas, lots of basil, and some early tomatoes and Asian eggplant, with lots more to come. I'll be harvesting the garlic this week and planting carrots. No bunnies, thank goodness. Your garden sounds delicious, Edith! Yes, the visiting bunny is adorable! At the far end of my yard, behind the apple trees, I saw a mama raccoon and three babies scampering into the nearby field. And later, in the same place, a red fox. There are two resident bunnies this summer as well--who munched on my nephew's kale and spinach, but they left the tomatoes alone. They seemed especially fond of the dandelions (yay!). Bluejays, cardinals, titmice, a catbird (also my favorite), downy woodpeckers, hummingbirds--lots of birds at the feeders--I call them 'kitty theatre'--keeps the cats enthralled. What a lovely and peaceful garden. Living in the countryside, I'm surrended by nature. Sadly I don't know the French name of many plants and birds and when I know the French one I don't know the English one, so it would be difficult to describe mine but I have maple trees and birches and a fir. 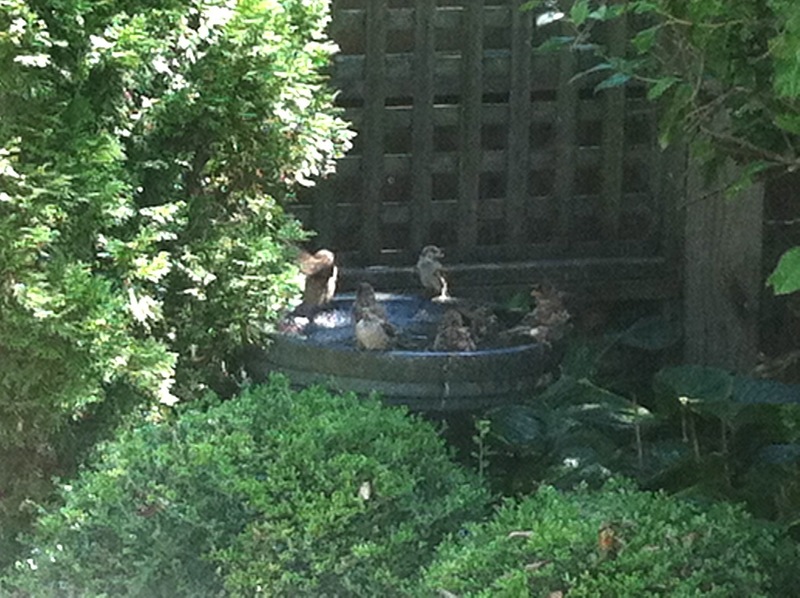 Your birdbath is a busy spot! And that last little bunny is so adorable. We have lots of wildlife in our garden at home, especially since Steve does feed the birds. And at the farm, too. There, in addition to birds, bunnies, chipmunks, squirrels, and deer, we also have raccoons, skunks, foxes, and turkeys. And the occasional bobcat, which is a relatively new addition. I have seen one yet, but Steve has, and so have our renters. We took down our vegetable garden, so the only flowers are in the front, where it is currently too hot to sit past 10a.m. I should go around the house to check on the callas. We have tons of rabbits, also because of the plethora of clover. The occasional deer, also turkeys. Lots of birds. I wanted to put out a bird bath, but The Hubby said it would be the equivalent of baiting a trap for the neighborhood cats. Neighbor put out a feeder next to their fence, so I watch the birds swooping around. The only ones I can identify are the robins, blue jays, and cardinals (last night I saw a female with two males in close attendance), but there are others. And of course we are a stop on the trail for all the felines nearby. My parsley and basil are doing great and the blueberries are beginning to ripen. But the bunnies, chipmunks and deer are also around. The deer have decimated my hostas, even the ones close to the house. Hallie your visiting bunny is the best! Loved the cardinals in the bird bath. I'm surrounded by woods and I often hear the cardinals but seldom see them. I won't put out seeds for them because I have an outdoor cat. We have a small rabbit in the weed-choked front beds. And for the first time in the ten years we've lived here, a garter snake in the backyard. I pound the ground with a hockey stick before I venture into the flower beds. The dill went to seed, the raspberry monarda is on the decline, the rosy returns daylilies just beginning to bloom. Lots of fledglings out and about: robins, song sparrows, house finches, cardinals. Serenity in the garden! Embrace it. Our garden is always interesting, lots of birds and beasts. The chipmunks thrive, and Toby and Penny try so hard to catch them, unsuccessfully. The beans are coming on, still too small to pick, and the Sungold tomatoes are turning, well, sun gold. The sweet potato vines I planted in the geranium pots are taking over the world, not to mention the geraniums. The orchids and Christmas cactus, moved outside for the summer, are flourishing. The red fox has made his yearly appearance, and we're waiting for the woodchuck migration. The wild turkeys nested elsewhere this year, but the chickadee family are healthy, wealthy and fledged. There's a bunny burrow in the rock garden, but with the dogs in and out, I rarely see the babies. They more often appear in the front garden. It is hot and humid today, so no morning coffee time. I'll just look out the window. I have tiny gardens out front and in the back. The front bed is full of Texas perennials that feed the birds and can stand up to the western sun in the summer. That's also where I have my roses. It's glorious in the spring, but right now everything is going to seed and looking a little mangy. But in the back? Ah! In the back I have a little patio that faces east, shaded by a low wall and a large catalpa tree. This summer I used some leftover construction junk to make a two-tier plant stand which I have filled with every shade-loving plant I can put in a pot. I have lots of begonias, three caladiums, some bright impatiens and sage, plus four ferns and all sorts of other things. I probably have 30 plants crammed onto that plant stand, and the toads have taken up residence, eating all the mosquitoes that hatch out from the daily watering. I also have butterflies, moths, and bees stopping buy regularly. In the old holly hedge down the driveway I have a pair of mockingbirds and a pair of robins nesting, plus regular visits from a pair of cardinals and a couple of house sparrows. I have not yet figured out where to hang a hummingbird feeder or put up a bird bath, but I'm sure they're on the horizon. Oh Hallie, that you for sharing your garden this morning. Enjoy your coffee. Love the bunnies, Hallie, especially the last one! My desert plants are in survival mode. Luckily, the monsoon rains have arrived to help them through. And my traditional garden has gone rogue. In the usual patch of sunflowers a random squash of some undetermined type has popped up and in strangling the sunflowers. I'm letting it, mostly because I am curious as to what sort of melon/squash/pumpkin it is. Please don't let it be zucchini!!! We use squrrel-proof seed feeders for the birds. Works great! Rick, my husband takes photos for most of the squirrel-proof feeder manufacturers. If there is a live bird in the photo on the box, chances are good that he took the photo. We have seen a LOT of squirrel-proof feeders over the years. And own a fair number of them, too. Your little piece of heaven is just perfect, Hallie. I need a place like that to sit. We have a large yard, but not sweet garden spot. I do love watching the bunnies and the birds, too. We have rabbits from momma to juvenile to baby, and they are loads of fun to follow. 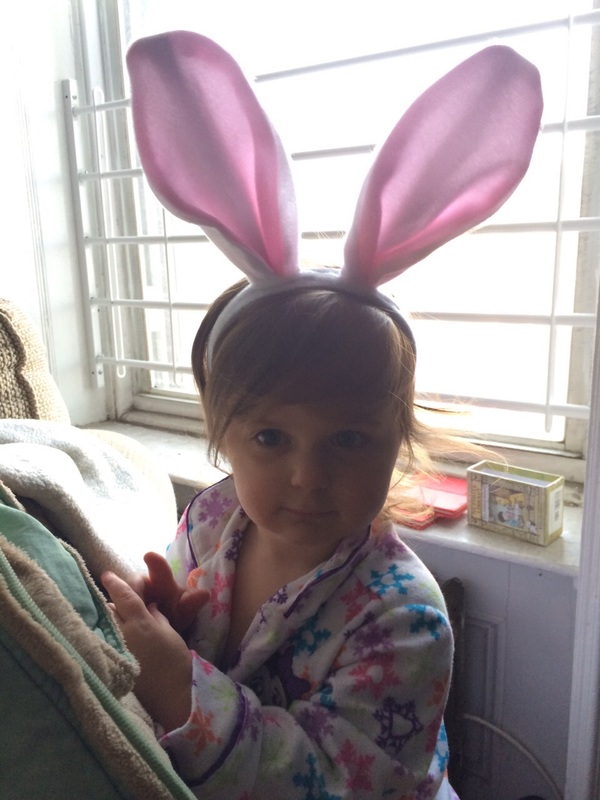 Of course, nothing can beat the exquisite grandgirl bunny you have pictured to watch grow. We put out food for the birds, and the squirrels do visit, but they all seem to exist in some sort of acknowledged harmony that is quite special to observe. I have been thinking of putting out a bird bath and will probably start looking at those soon. Loved seeing your pictures. I don't have a garden, however, I do have a birdfeeder out on my balcony. My cat loves to watch the birds out the window. My garden is doing pretty well, although some of the coleus are wilting a little. I only have one tomato plant and some herbs because I'm single and not into canning or freezing. Flowers are my thing. The daylilies and coneflowers are blooming now along with many annuals. I have birds, bees, and butterflies which I like, and squirrels which I hate because they dig up things and sometimes bite my tomatoes.